In the shadow of the Second World War, British India’s eastern province Bengal experienced a famine of enormous dimensions. Caused by the disruptive forces of India’s War engagement on Bengal’s economic, political and social structures and aggravated by the attempts of the colonial authorities to silence the crisis starvation and the subsequent spread of epidemics amounted to the death of an estimated number of 3 million and left many more uprooted and impoverished. Despite the immense scale of suffering and the urgent need for a concerted effort to save the many lives at risk, relief reached the affected areas with considerable delay. It was only in November 1943, one year after the first signs of famine had shown, that the colonial government eventually launched a relief mission to render food and medical care to Bengal’s dying population. The decision of the colonial authorities to embark on a relief mission was nourished by the growth of public pressure in Britain and India. 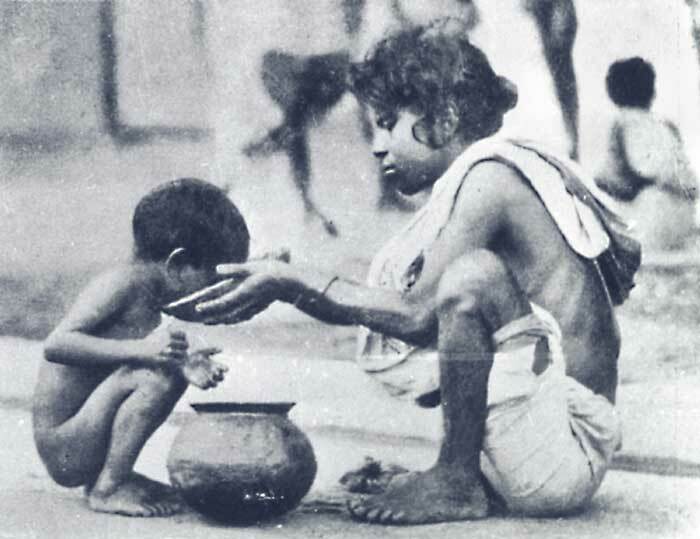 The demand for relief for Bengal’s population gained considerable momentum after graphic accounts of suffering in “the Empire’s Second City” had entered the mainstream press at the end of August 1943 in Bengal and the following month in Britain and created a long overdue outcry that challenged the official politics of silencing the famine. The delay of the international media response contrasts strikingly with reactions to previous famines in India. This owed much to the colonial authorities’ prioritisation of security concerns and military necessities, which came at the expense of the free circulation of information. In 1939 the colonial regime promulgated the Defence of India Act which added a vital instrument to the existing legal regulation of the press and enabled the authorities to ban print material perceived as harmful to the war effort. In many regards, the public awareness of famine in Bengal was perceived as harmful to military considerations. First, it potentially provided Japan with an incentive to invade Bengal, which by 1943 had become the Allied Forces eastern war front and central to the supply and production of war materials. Second, the advent of famine in India provided ammunition for Indian nationalist demands. And third, the diversion of resources to relief efforts was perceived to endanger the smooth operation of the war machinery and industry. The colonial regime therefore attempted to conceal the severity of the food crisis. Official statements in London downplayed the crisis and words like “famine”” and “starvation” were frequently erased from despatches to be replaced by the less alarming euphemisms”food situation”. However, given the web of informal relations that connected Bengal and the world, the attempt to control all channels of communication could only be maintained with great energy, personnel and persistence. Since early 1943 Indian and British supporters of India’s demand of self-rule attempted to raise awareness in Britain, drawing on their contacts to the diaspora to circulate news from Bengal. Local newspapers in Bengal contained frequent reports about the daily horrors they encountered, whereasletters of British and American soldiers in Bengal began falling through the cracks of censorship. As a result, information about the famine trickled into the metropole, but public attention was at first considerably diluted to ongoing horrors in Europe. Overshadowed by the war, news about India’s food crisis failed to compete with images of human suffering in enemy-beleaguered territory. Only in September the smokescreen dissolved and mainstream newspapers across the British Empire and beyond picked up the issue, owing in part to the efforts of India’s local and national press, alongside the mass migration of the rural starving ‘destitutes’ (a term used by the authorities) into urban centres. The influx of hundreds of thousands from the rural areas of Bengal into the international hub of Calcutta, forcing the still well-fed population of the city to confront the sheer suffering of the village people. Among the witnesses was the editor of the English-owned The Statesman, Ian M. Stephens (1903-1984), who after failing to arouse attention with his critical editorials, decided to use the loopholes of the emergency rules that controlled the All-India press. In its Sunday edition on August 22, The Statesman published a series of horrifying famine photographs. While shocking pictures of famine sufferers had been permeating Bengal’s Indian newspapers for months, the India-wide distribution and high reputation of the English-owned The Statesman transformed the Bengal famine overnight into an international news event. The photographs printed in The Statesman were reproduced in newspapers around the globe and directed the media’s attention to Eastern Bengal. Importantly, this gave the increasing number of critics from within and without the colonial system evidence to prove and emphasise the severity of the situation, while the growing public discontent enforced official reactions. With images of starving populations in war-torn Europe used in the British press to emphasise the barbarity of the enemy, similar photographs of skeletonised fellow-citizens potentially unsettled such narratives and caused bewilderment. In a caption printed beneath two photographs republished with the courtesy of the Statesman, a British weekly observed: “They are not German slaves in Greece. They are citizens of the British Empire in India. […] There can be no excuse for this shameful neglect. All Britain must demand that these people are fed without delay, by the Government whose job it must be.” (Sunday Pictorial, September 25, 1943). The circulation of images from Bengal and the public outrage it released paved the way for a variety of civil society responses, including the formation of famine relief committees, the organisation of charity events, and the deputation of newspaper war correspondents to Bengal. Corresponding with earlier examples in the history of food crises in colonial India, the circulation of news of famine in India increased the presence of foreign actors in the subcontinent, heightened the pressure on the colonial government to respond to the calamity and opened up debates on the legitimacy of colonial rule in India. As such, the media played a decisive role in nourishing civil society responses, which once more provided a much needed counterforce to colonial attempts to silence famine in India. The tone in the House of Commons also sharpened as questions about the conditions of Bengal could no longer be muted. Proving the worst fears of the colonial government, the new publicity of the crisis and the attention it received was harnessed and nurtured by Indian nationalist groups and anti-colonialists who portrayed the famine as the final proof for the necessity to end colonial rule in India. And they were now in good company. Philanthropists, pacifists and liberal politicians challenged the colonial information management by publishing their own accounts of what they knew about the crisis. With the growing awareness about the extent of suffering experienced by Bengal’s population, the colonial regime was forced to explain how it failed to prevent starvation in its colony and what measures it adopted to address the calamity. The famine that ravaged nearly unhampered in Bengal throughout the year 1943 has still received only scant attention of historians of humanitarianism. This is surprising given the amount of work that has been published by South Asian scholars on the events as well as the scale and scope of the crisis. The genesis and development of the famine in Bengal was decisively determined by the exigencies of the world war that conditioned the prioritisation of military and security concerns over civilian needs. As such it provides a lurid example of the detrimental impact of war on civilian populations and the importance of the convergence of political, military and humanitarian interests to enable the effective mobilisation of relief. The review of the emergence of responses to the famine further points to the indispensability of the media in bringing the needs of distant populations to public attention. While the use of famine photography to solicit donations and support is commonly associated with media campaigns in response to the Nigeria-Biafra conflict of 1967-70 and the Ethiopian famine of 1983-85, such uses of visuals of famine have telling historical precedents. The circulation of famine photographs in response to the Bengal famine is one example and illustrative for the centrality of visuals of famine in the mobilisation of human and financial resources to render relief to affected-populations. Mukherjee, Janam. Hungry Bengal: War, Famine and the End of Empire (Oxford: Oxford University Press, 2015). Mukerjee, Madhusree. Churchhill’s Secret War: The British Empire and the Ravaging of India during World War II (New York: Basic Books, 2011). Ó Grada, Cormac. “‘Sufficiency, Sufficiency and Sufficiency’: Revising the Great Bengal Famine of 1943-44”. Eating People Is Wrong and Other Essays on Famine, Its Past, and Its Future (Princeton and Oxford: Princeton University Press, 2015): pp. 38-91. Stephens, Ian. Monsoon morning (London: Earnest Benn, 1966). Twomey, Christina and May, Andrew. J. ‘Australian Responses to the Indian Famine, 1876–78: Sympathy, Photography and the British Empire’. Australian Historical Studies 43, no. 2 (2012): 233-252. Simonow, Joanna. ‘Understanding humanitarian action in South Asia. Responses to famine and displacement in nineteenth and twentieth century India’, HPG Working Papers published by the Overseas Development Institute, May 2015, https://www.odi.org/publications/9529-india-pakistan-bangladesh-famine-british-colonial-displacement-partition [24.08.2016]. Joanna Simonow is PhD candidate at the Chair for History of the Modern World of the Swiss Federal Institute of Technology in Zurich (ETHZ). She completed her Magister degree in History and Political Science of South Asia at the University of Heidelberg and holds a Joint Master’s in International Relations/ Humanitarian Action from the Universities of Groningen and Uppsala. Her current doctoral project explores the production of narratives and images of Indian famines in the first half of the twentieth century. Joanna was a participant of the Global Humanitarianism Research Academy 2016. Citation: Joanna Simonow. ‘Bengal, 1943-1944: Famine Relief in Times of War’, in Online Atlas on the History of Humanitarianism and Human Rights, edited by Fabian Klose, Marc Palen, Johannes Paulmann, and Andrew Thompson, 2017-07, urn:nbn:de:0159-2017071013 [2019-04-26].